The 501-43 is a 2 column desk with a minimalistic look, an open frame structure and a clean-cut. You can recognize the 501-43 by the square column and slender design, it is available in 3 different colors and sizes.The robust frame makes the 501-43 a strong and durable desk for any office environment. Conset has its roots in Denmark and this product reflects the high standards so typical of Danish furniture. This sit to stand table/desk Ships Free in as little as 7 business days. Easy to assemble and is backed by a 5 Year factory warranty! This model is a BASE ONLY and does not come with a desktop, which you must provide yourself! See the entire 501-43 desk here. Bulk discount of 10% off in the cart when 4 or more are ordered! Options: Add this great Easy Goes It Anti-Fatigue Mat that will help reduce foot, leg and back fatigue so you can stand more while using your sit to stand desk. ConSet A/S is a manufacturer of sit/stand tables. The company was established by 3 engineers in May 2000. It was our belief that sit/stand tables were too expensive. We decided that we would strive to offer these products at prices that would make them accessible to everyone. We succeeded quite well. In cooperation with others we have experienced a trend of constantly decreasing prices. Sit/stand tables are already demonstrating promising growth in the US market. ConSet A/S is a well-founded company experiencing constant growth both in Denmark and abroad. The 501-43 is a 2 or 3 column desk with a sophisticated look, an open double telescope framestructure and a clean cut. 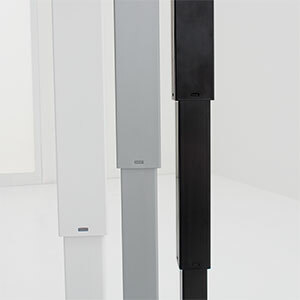 You can recognize the 501-43 by its square column and slender foot design. It is available in 3 different colors. Add the third column and you get a desk, which offers plenty of space for all kind of job functions. The robust frame makes the 501-43 a strong and durable desk for any job environment.